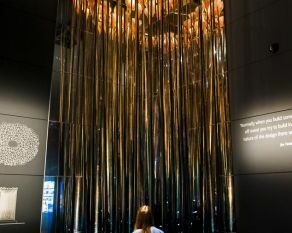 Thomas Heatherwick’s London 2012 Cauldron is the star of this gallery. 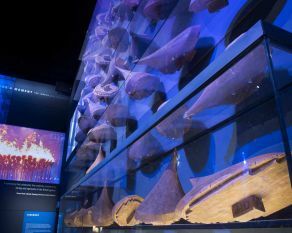 With dramatic footage and exclusive testimony, we recapture its journey from design to the climactic opening and closing ceremonies. The cauldron frozen in time during the Olympic opening ceremony. Some stems have come to rest in their final positions whilst others have only just started to lift. 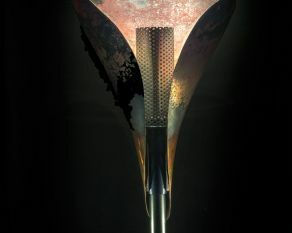 The London 2012 Cauldron was created by the internationally renowned Heatherwick Studio and has become one of its best known works. These blocks acted as templates to guide the metalworking team creating the copper elements. Close up, traces of hammer blows remain visible at their shattered edges. 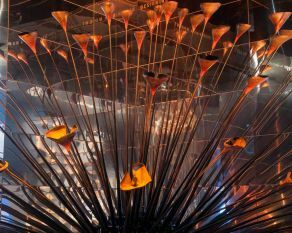 Scorch marks and a colourful tarnish hint at this petal’s brief time ablaze within the London 2012 Cauldron during the Games. Just outside the 2012 Cauldron gallery. Relax with a drink or light snack at the end of your visit in this calm, open space. 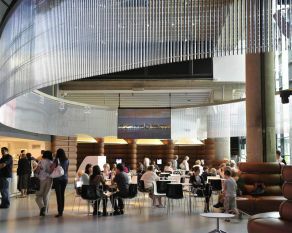 The gallery is on the lower ground floor and can be accessed by lift and wheelchair ramp.